5 Toys for Kids in 5 Minutes Each at Less Than $5 – perfect for a rainy day, a bored moment, a change of direction from jumping on the bed, a snow day or anytime an extra quick thing would help entertain and inspire children. Then, where I used the backing package from a diecast car bought at Christmas, almost any one for the floor plus three sides around box shape large enough to fit the characters more or less – will work for a stage. If it is bright and textured without words or other elements for distraction – the stage will allow the most room for the children to interpret it as they see fit. And, if it is a plain box, almost any nifty paper, leftover gift bag with holographic foil, wall-paper sample, gift wrap or small fabric remnant can be pasted over the surface with stick glue. I would say that – to spend time pasting a surface on the box will do better if the children help rather than having to stand by and watch. 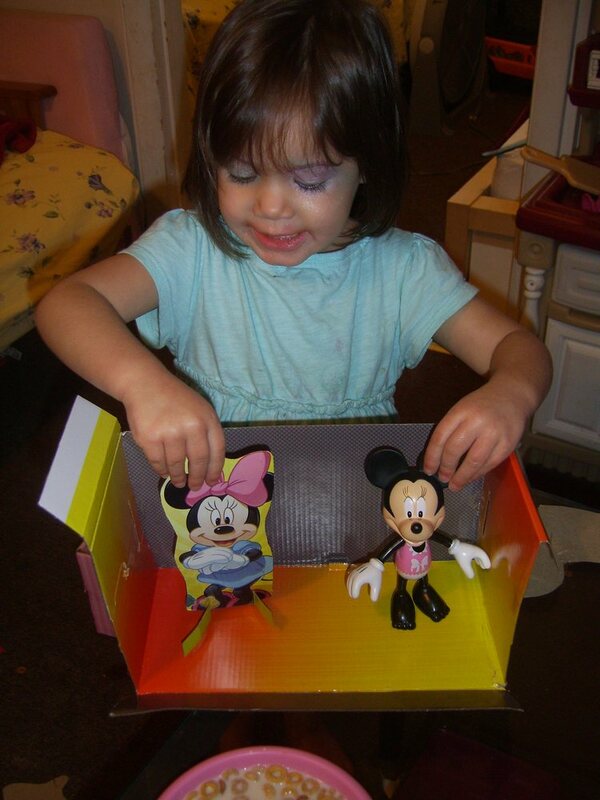 The project will take less than five minutes if the box doesn’t need extra surface materials – but either way – it is a brand new toy with four or five characters that two children can enjoy for an hour, maybe longer. 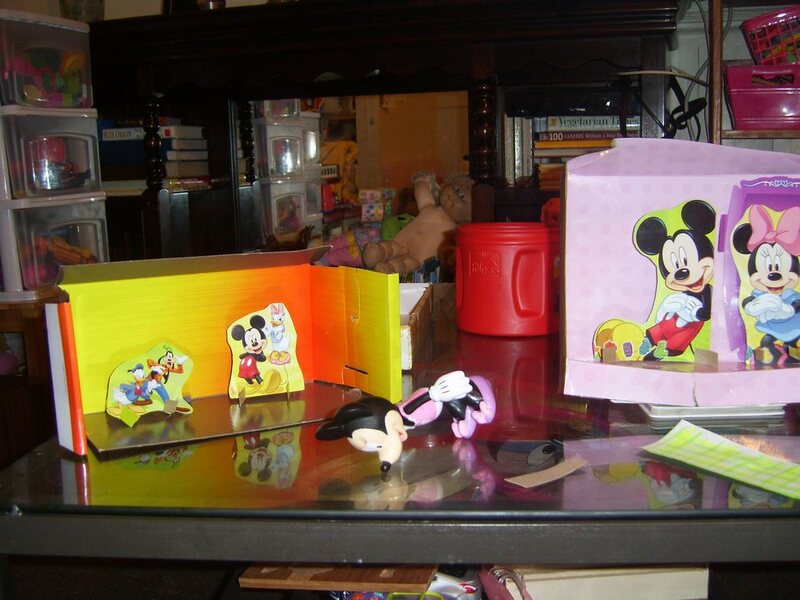 Ours lasted about three days because the girls kept coming back to it and then used the characters for other things. These ribbon streamers take less than 5 minutes to make and children, even as young as three years old can actually make them with just a little bit of help. I used the bendable color straws that we happened to have already and the smooth curling ribbon from a package of six colors leftover from Christmas wrapping efforts. The ribbon was cut in varying lengths rather than precisely the same size because they will flow in the air better and the lengths were about three feet each so they would do a figure 8 in the air as the children played with them. The straw end did not get any glue, nor the ribbons because if the ribbons are seated far enough into the end (in this case six ribbons per straw) – they will hold long enough and if they come loose, the child can simply take a minute and put them back, which gives them something else to do as well. 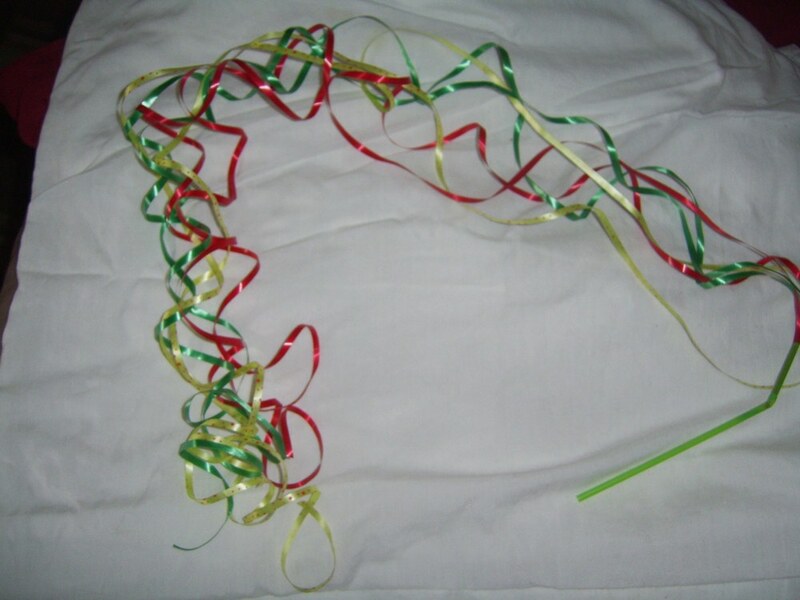 These ribbon streamers take six – three foot lengths of different wrapping type ribbons pushed into one end far enough for them to hold and then can be used for dancing to some music, jumping around through the house with them streaming overhead, or swung in figure eights across each side of the body like a jump rope for fun exercise that doesn’t seem like exercise. It takes a few minutes to make them and then after the “new” wears off having fun with them, they can be set aside to play with another time or outside when the weather is nice. Perfect for indoor play. 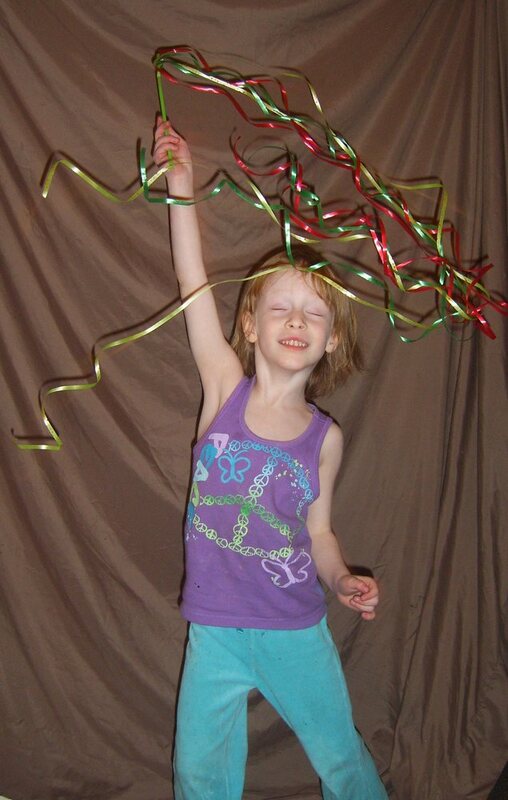 After making the ribbon streamers, we put on the cable channels with the new urban Tropical and Latin music so we could dance and play with the streamers. Yes, I did dance around with them and look silly waving the ribbon streamers over my head and it was so fun and giggly that I would do it again. Very fun. – a companion to the ribbon streamers can be to take some construction paper and cut caterpillars from it, tape the head to a straw and then have a caterpillar parade through the house. To make a caterpillar from a piece of paper, simply start cutting about 1/2′ from the edge along a more or less straight line and continue the cut around and around toward the middle of the paper with each cut leaving about a 1/2″ width from the last – it will cut a nicely odd pyramid shape once the center is held up. And, by leaving a little circle or oval shape at the center with the rounds emanating out from it, a caterpillar face can be colored in with crayon or marker by the child – eyes, nose and mouth. Then tape the caterpillar head on its back to the bendable short end of the straw and host the caterpillar parade. The caterpillars will stream behind the children in the air and they can make about thirty of them in a short period of time to select from. Two or three caterpillars per child flowing around in the air to a bit of music makes the most fun for what can be an hour or two. If there are sparkles or glitter or sparkly paints to add – it might last longer than that. And, although this sorting effort takes a bit of adult attention to loosely monitor the activity from nearby even for a six or seven year old, it is fun and entertaining to children as they learn not only sorting, but the identifying abilities they have to note the differences and “samenesses” or similarities in the pieces. In this game, I answered a lot of questions that would have never otherwise been asked about threads of machine screws compared to wood screws, about what velcro is and why it works that way and what some items happened to be – like S-hooks and the little screws with the circle on the top, as well as how the nut and bolt fits together. 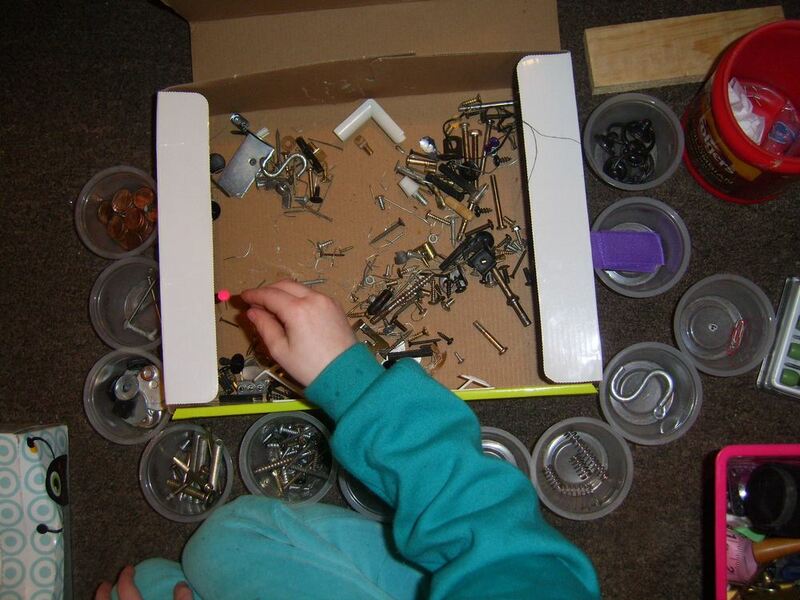 Sorting makes so many other things possible and there are many items used everyday, from push tacks to nails to machine screws to nuts, bolts and wood screws that children today haven’t had a chance to touch or learn about – that this sorting game gives them a chance to do. This game can be done for less than $5 and if anything else is done – do this for certain – DO NOT dump the little cups back into the box to do this game again later – it is an insult to the child and does not honor their efforts nor celebrate what they have done and the next time, they will head the other way with disdain and understandably so. The sorting game done this way, can be done by children as young as three or four years old but only if an adult with nothing else to do is sitting right next to them doing it together with them. And, this doesn’t mean on the cellphone, computer or watching tv at the same time. It is a complete attention thing with toddlers and children younger than six and a nearby attention thing for any child under ten. Any child that will put anything in their mouths that is not food – is not going to be able to do this activity without complete attention by an adult sitting with them while it is being done (together). 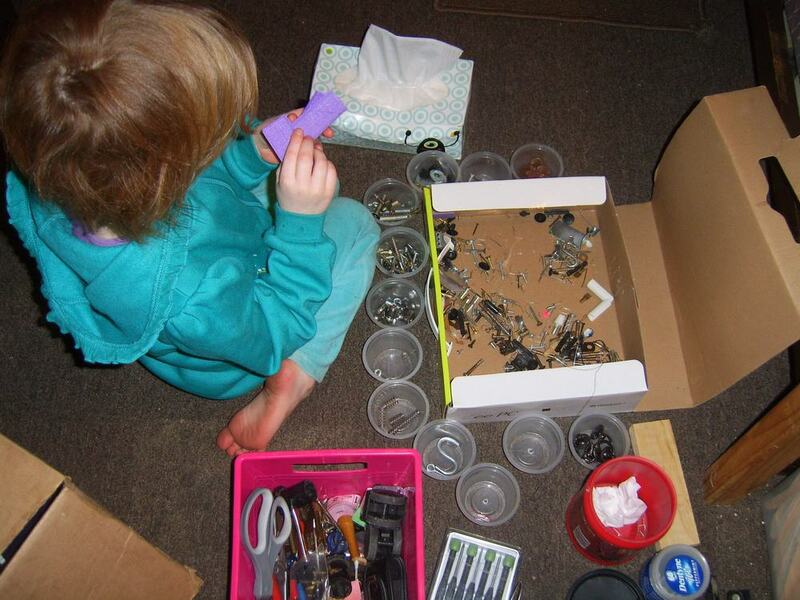 There are other ways to create the sorting game, including allowing children to sort the junk drawer of some other type – but not papers, old mail, and junk mail types of paper. Shaped items are better where there are many of the same or similar kinds in the same drawer, box, or place that can be sorted for their similarities and differences. A quick note – children and adults alike almost universally hate sorting the sock drawer which makes it “not a game” and shouldn’t be confused with this type of “special fun” activity. Sorting the pans and Tupperware in the cabinet might be fun to a two-year old though, despite the fact that most of the rest of us would look at that as a “not fun” thing and they are good at it, proud of their accomplishment and learning at the same time. 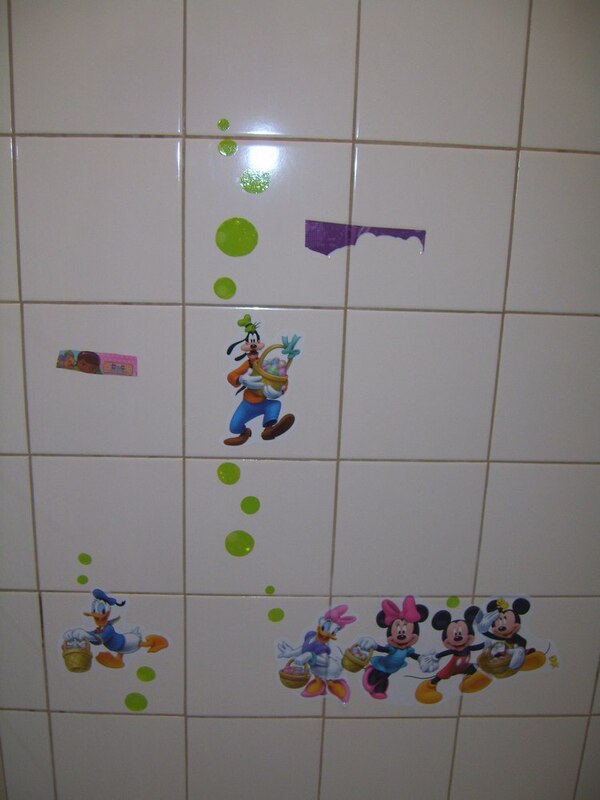 Decorate the Bathroom Walls – with Bubbles and Characters – a Two Part Fun Toy and Game – the green “bubbles” circles were cut by hand from the “betweens” on the decal sheet and added to bring the design together. At most dollar stores, many groceries and at most large retailers like Wal-Mart and Target, the window decals that cling are sold, especially during holidays. They can be found at Michaels arts and crafts stores, JoAnns and at a host of Family Dollar, Dollar Tree and other Everything is a Dollar Stores. As much fun as it is to let kids put these stickers on the windows, especially during holidays – it is even more fun to let them put the cling decal stickers on the nifty surfaces around the house. Refrigerators work as a place to put them but don’t put them on stoves because of the heat and some kitchen cabinets will accept these decals, but I personally couldn’t stand seeing them there. Almost any clean mirror or on the under side of a glass table top will work as well and kids love seeing them show through to the top side which teaches them more about glass than almost anything else besides breaking it. “Bubbles” floating between the figures for the shower tile – very nifty and fun to do. These make a toy that can be put somewhere else later as well. The most fun, though – is to use the decals in the bathroom to decorate the tile of the shower or on the sides of the bathtub or tile surround for the tub. On these surfaces, the decals can stay awhile, be seen by everyone and the children enjoy putting them there which gives something to do that is creative and interesting and fun for twenty or thirty minutes. 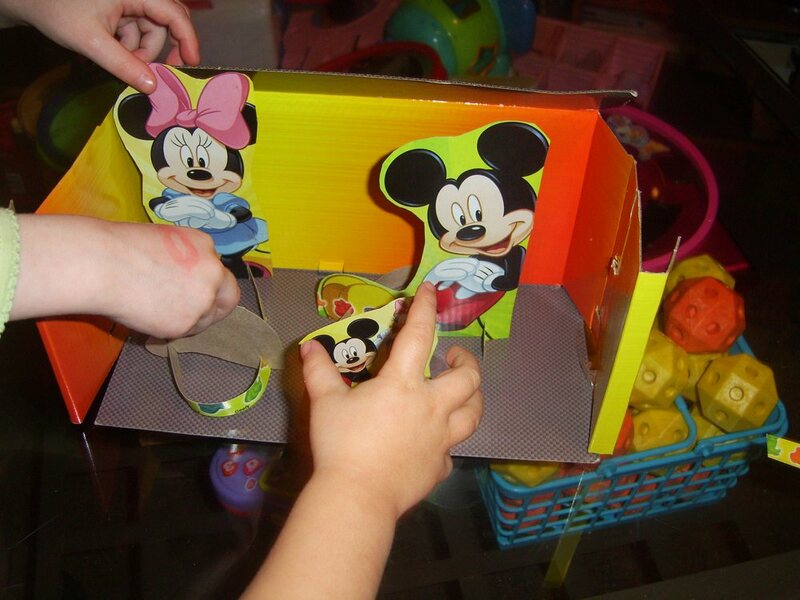 For the second part of this toy – it may take an adult to cut them, but the in-betweens surrounding each of the decals as they have come from the package, can be used to cut “bubbles”, circles, triangles, squares, tear-drop shapes, trapezoids or diamond shapes to add to the scene the children have created and tie it all together. I made the circles and laid them out as they were cut and the children would come by to see them, touch them and ask about how many more could be made from the in-betweens as well as cutting some circles themselves – or at least giving it their best efforts. The betweens are usually small and oddly shaped which makes it harder to concept how a circle is cut from the space, but I’ve noticed that children are fascinated to watch that circle being created from that oddly shaped space – or triangle, diamond or square. The children enjoyed putting the window cling decals on the fridge but they loved putting them on the shower tile even more. And then when the bubbles were added – it made a two part fun that left a very nifty looking bathroom too. Placing the new elements into the place where the children designed with the decals makes a fun together activity or they can be allowed to add the new elements themselves – either way, it is a fun toy with a lot of enjoyment, learning, fun and pride of accomplishment which the children can see every time they are in the bathroom, taking a bath or shower – or showing it off to parents, aunts and grands. And, it lasts as long or for as little as someone can stand to have it there – the stickers are waterproof, they stay on through showers, steam and baths, and can be re-done some other way later if desired – or placed on windows later – or on the fridge or hopefully, anywhere that isn’t the computer screen. Word Reading Games are Fun when children can see what the words can build and find the words themselves with a little help. There are always bits of junk mail sitting about my house and scissors, some white computer paper and other colors of heavier computer paper or cardstock and usually a pile of construction paper somewhere along with glue sticks so this game is ever handy. It does require a bit of attention though especially when children are first learning to read and understand that words are something. 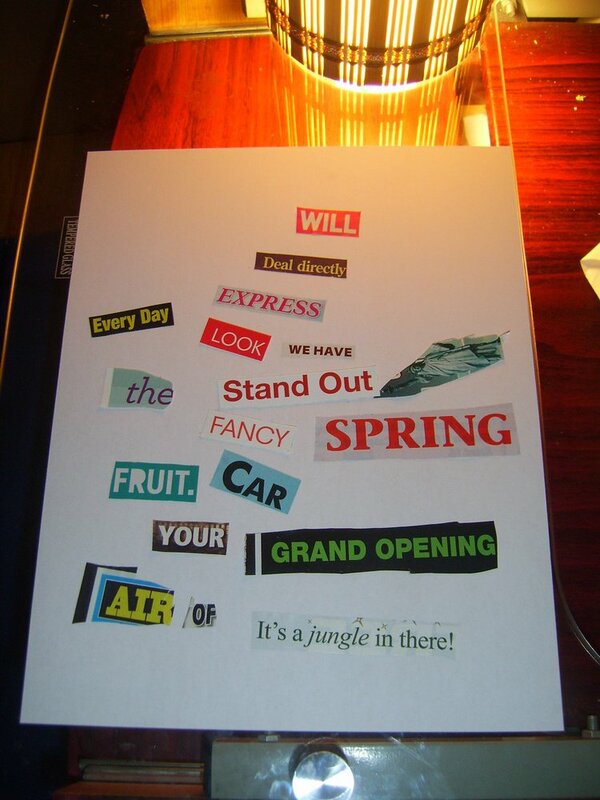 My granddaughters love doing this game, finding the words in the junk mail and cutting them out with me and asking what different words are and being surprised to see that they recognize the said word and there it is in this written glossy page that came from somewhere else. We don’t try to make sensible sentences from what we find – and that yields its own stories about what it could mean, like the sentence above that created an entire hour’s worth of fun and funny discussion about it. I wouldn’t do this game without an hour to give to it, though often it lasts more like fifteen minutes and that is okay too. This game takes some paper, some scissors, some attention, some junk mail or old magazines and at least a glue stick – white glue will make the paper buckle, is messy and isn’t near as fun. There are infinite combinations including cutting the words from the cardboard of cereal boxes and other things that would basically be thrown away regardless. I help cut words and answer questions about words for the children as we do it and then place them on the floor or table into a sentence with them and sound out the sentence so they can hear it. In case it isn’t obvious, this toy helps reading skills, verbal skills, thinking skills and offers a measure of healthy adult attention on the celebration and specialness of reading and words – its actions convey that without ever having to say it. This game / toy experience is filled with opportunities for surprise, interaction and excitement about reading skills being something wonderful and helps children to make the connection between those funky symbols they see everywhere and the fact that those are words that they would recognize if they hear them said out loud. With a piece of paper and a pencil – any adult can make a maze for a child to do – it doesn’t take finding one in a book or coloring book or highlights magazine. Just make sure the maze can be accomplished and a child sitting in a waiting room will be able to do it and possibly make one themselves for someone else to do. It is at least a twenty minute fun thing and entertaining to explain why the pathways have to allow one to connect all the way through and show how that is created. It isn’t rocket science but it does yield rocket science in the long run – and inventors – and inventiveness – and resourcefulness – and creativity – and exemplary thinking skills that combine the creative and the practical into new things. Very nifty. In a houseful of toys, sometimes it just takes something new right quick to make playing more appealing. Any toy that can be created in 5 minutes and played with longer than it took to make it – is a good toy. And, even more fun if children can see it being made or help in making it.